The increasing density and high-quality processing demands from video applications is pushing broadcast and communications networks to the limit. Adding more equipment to handle these video streams is not economically viable. What’s more, operators, service providers, and content providers see the benefits of using standard servers in the cloud, and want to move away from special appliances or ...dedicated hardware. But standard servers currently are not optimized for video transcoding in the cloud. The best solution is an accelerated video cloud: PCI Express* video acceleration cards in standard servers. 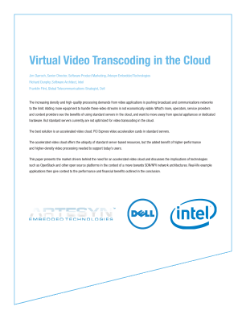 The accelerated video cloud offers the ubiquity of standard server-based resources, but the added benefit of higher-performance and higher-density video processing needed to support today’s users. This paper presents the market drivers behind the need for an accelerated video cloud and discusses the implications of technologies such as OpenStack* and other open source platforms in the context of a move towards SDN/NFV network architectures. Real life example applications then give context to the performance and financial benefits outlined in the conclusion. Interview with Nasdaq VP Mark Silber on how Intel helps the Nasdaq exchanges deliver fast, efficient, cost-effective services.